Read more about the redesigned State Archives of North Carolina website at our records management blog. This entry was posted in Digital Services, Government Records, News and tagged records management, websites on December 8, 2017 by Ashley. Visit our records management blog for an update on text and instant messaging guidance. The State Archives of North Carolina has released an update to its Best Practices for Electronic Communications Usage in North Carolina: Text and Instant Message document. Released in February 2017, this document is an update to the 2012 guidance document for state agencies using text and instant messages in the workplace, including employee responsibilities according to general statutes and records retention and disposition schedules. This entry was posted in Digital Services, Electronic Records, News and tagged Electronic Records, reblogged post, records management, Sunshine Week, technology, text messaging on March 16, 2017 by Ashley. Hurricane Matthew is expected to move north along the east coast of the U.S. later this week and into the weekend. Even if the eye of the storm remains offshore, hurricane or tropical force conditions could still impact North Carolina. Those in the storm’s path should prepare for possible wind and water damage. We are encouraging all agencies to stabilize your records storage areas before the storm hits, while also making sure that your response contact lists and resources are ready to use should your records be impacted. Ensure that records are 3-6 inches off the floor, if possible. Consider relocating records out of the bottom drawers of filing cabinets, away from windows, and out of basement and attic areas. Compile some recovery supplies, including plastic to cover cabinets, records boxes, and bookshelves. In the event that your records do get impacted, please contact the State Archives immediately. This entry was posted in Government Records, News and tagged disaster preparedness, disaster recovery, records management on October 5, 2016 by Ashley. How Did We Move a Warehouse Full of Records? Moving into the new warehouse. 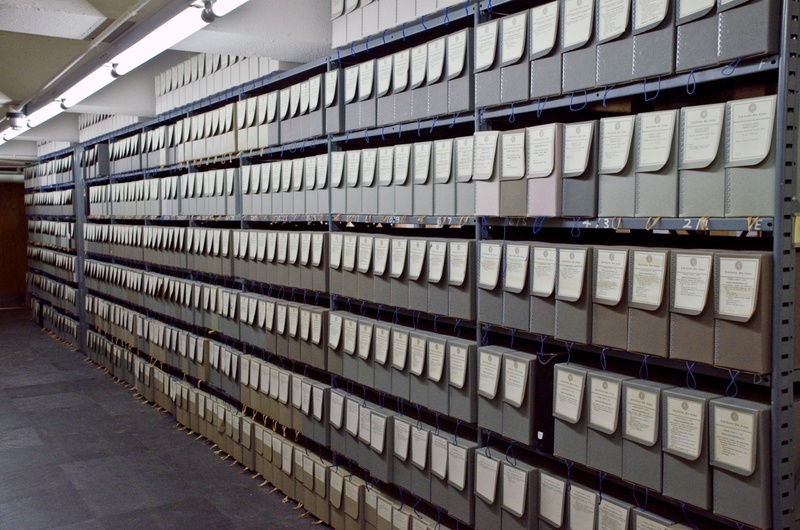 One of the primary functions of the Government Records Section, Division of Archives and History (State Archives of North Carolina) is to provide state agencies with storage facilities for their inactive records. We operate three storage facilities to accomplish this goal. Due the term of the lease ending with one of our storage facilities (BSA), the staff of the Division of Archives and Records has engaged in a massive storage facility relocation project that took place from May 2014 to March 2015. This project started almost a year ago in April 2014 when we began to work with the State Property Office to seek new leased space. Once the bid process was completed and the proper contracts were signed we obtained a new leased space in September 2014. The staff of the State Archives worked in three phases to transition the records from the former storage facility (BSA) to the new warehouse (Front Street). Phase 1: Preparation and Planning; Phase 2: Removal of Records and Disassembly and Reassembly of Shelves; and Phase 3: Re-shelving of Records. Destroyed 18,229.55 cu. ft. of materials scheduled for destruction. Moved 8,776 cu. ft. of records from the BSA to one of our other two storage facilities. Hired a structural engineer to design a shelving plan for the new warehouse facility. Prepared the Scope of Work and received bids from contractors to 1) remove the records from the warehouse; 2) Store the records in a temporary location; 3) Move the shelving from the first warehouse and rebuild the shelves in the new facility; and 4) Return the records to the shelves in the new facility. The contractor was secured in early November 2014. Developed workflow for records relocation. We also developed documentation to track the movement of the boxes from the shelf to the pallet, the pallet storage in the temporary location, and placement of the boxes in their new location at the new facility. Detailed documentation of individual series of records (including which pallet they were stored) was important to capture, since the clear chain of custody for the records needed to be identifiable through all stages of the process. November – December 2014 contract workers and Division staff worked to palletize and remove records from the storage facility. Record pulls were completed in 15 days. 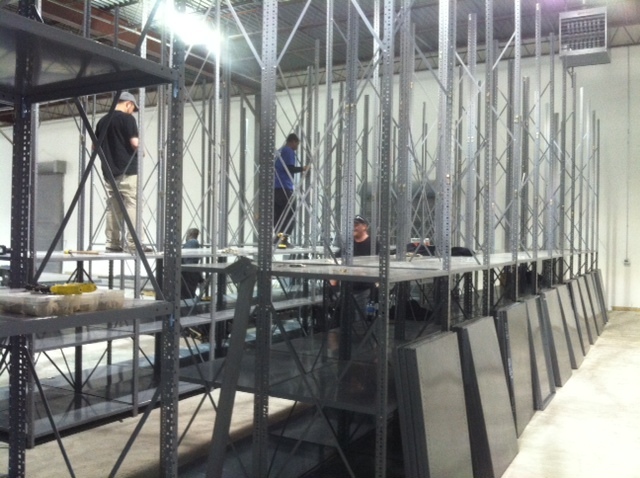 Late December 2014 – February 2015 contract workers disassembled and reassembled the shelving at the new storage facility. Hired lighting engineer to design a supplemental lighting plan for the storage facility. March 2015 contract workers and Division staff re-shelved records in the new warehouse. The final boxes were placed on the shelves on March 16th, meaning that work was completed in 10 ½ days. Lighting contractor is scheduled to install additional lighting. Now that the hard part is done we will focus our attention on ensuring that all box locations in our box tracking database have been updated to reflect their new location. This should take a minimal amount of time since we did a majority of the data entry in real time as the boxes were being placed on the shelves. The State Records Center has resumed normal operations. We are now servicing records requests for records stored in all three of our facilities, destroying records that have met retention requirements, and picking up records from agencies for storage at the State Records Center. After almost 11 months it is nice to get back to routine operations. We moved 37,116 cu. ft. of records on 696 pallets from the BSA to the Front Street facility. We had a handful of boxes that were damaged in transport, but for the most part the boxes arrived in their new home in good condition. In total we touched approximately 64,122 cu. ft. of records during this project. As a result of all the planning and preparation work done in the first phase of the move, as well as the relocation and destruction of records stored at the BSA, the overall cost of the project was reduced. This project was a major undertaking requiring the commitment of all State Archives staff to complete. All members of the Archives staff worked tireless to transition the records to the new storage facility. The result is a fully operational storage facility. This entry was posted in News, State Agency Records and tagged Government Records Section, records management on March 20, 2015 by Ashley. One of our standard records storage cartons equals 1 cubic foot and one of the archival fibredex or Hollinger boxes equals 0.4 cu. ft.
It’s that time of year again. Every January the staff of the State Archives of North Carolina devotes three days (January 13-15) to inventorying our various collections. This year we confirmed the location of approximately 29,700 cu. ft. of state agency, local, and organizational records in three of our storage facilities. While this is not the entirety of our holdings, the records inventoried this year consisted of the most frequently referenced series by researchers in our Search Room. In addition to verifying the locations of our collections, we also utilized staff resources to work on several additional projects, including barcoding records stored in the State Records Center, and processing two local record series. 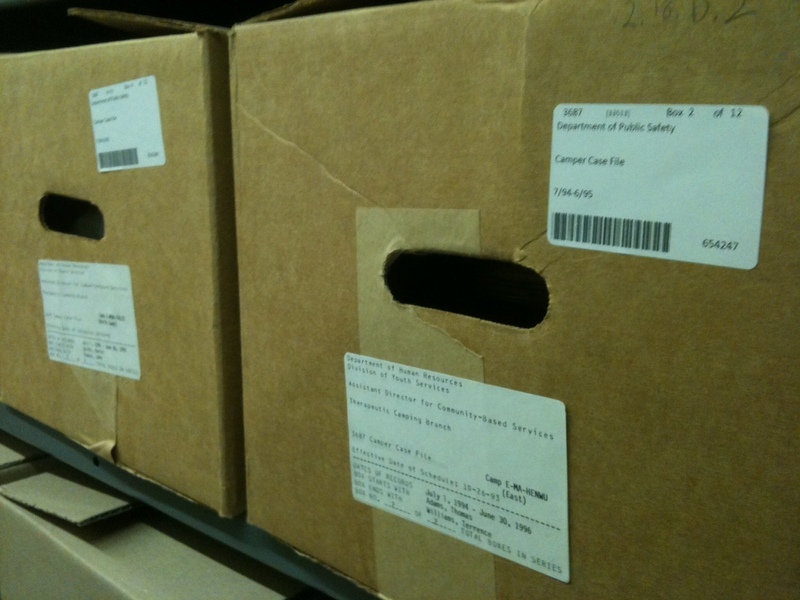 Recently barcoded boxes in the State Records Center. In the past year the State Records Center integrated barcoding into the process of storing inactive records for state agencies. We are currently barcoding records as the boxes are transferred by agencies to the records center for storage. We have also been working towards barcoding all records currently stored in our various storage facilities to more efficiently allocate available storage space. During inventory staff barcoded approximately 16,086 cu. ft. of records stored on the second floor of the State Records Center which is a substantial accomplishment in comparison to the 13,079 cu. ft. completed in November and December. It proves that when you concentrate your efforts you can accomplish great things. Finally staff processed (flattened, foldered, and data entry) for 17 cu. ft. of Durham County Wills, 1881-1966. Out of the 17 cu. ft. staff created 4,314 files (120 fibredex boxes). This project needs additional work before being integrated into the Archives collection. Once the processing of this series is complete, it will be available for researchers to access through the Search Room. In addition, staff continued data entry of the New Hanover County Estates, 1747-1939 adding 358 files (10 fibredex boxes) to the container list. Click here for completed county records container lists. Follow our blogs for progress reports on these collections. I hope this blog post has given you some insight into part of the routine operations of the State Archives of North Carolina as we work to ensure the continued accessibility of North Carolina’s permanently valuable records. This entry was posted in News and tagged barcoding, County Records, Government Records Section, records management, State Agency Records on January 23, 2014 by Ashley.